Compared are the US DVD (cut), released by Anchor Bay, with the US VHS (uncut), released by Media Home Entertainment. Sleepaway Camp has a cult status in these days, one of the reasons for that is its bizarre ending. Unfortenately, Anchor Bay wasn't able to release the Uncut Version and sadly there is still no (legit) uncut release on DVD worldwide. Some details about the different releases: The US Tape is uncut with an R rating. The Anchor Bay DVD is based on the R-Rated version, but sadly not complete. DVDs in other countries are cut as well, e.g. the UK DVD, also released by Anchor Bay, and the German Bootleg DVD (presumabely the Anchor Bay master was used). There's one exception: the Canadian DVD, released by Legacy Entertainment is uncensored, but this version is a bootleg, which was sourced from the US VHS. Now some details about the aspect ratio: The US DVD is in 1.85:1, the US Tape in 1.33:1 open mate. It's very unlikely that the open mate version is the version, which is prefered by the director. There's always some free space in the upper parts of the images, plus some scenes in the kitchen proof that the film was shot in a studio. See pictures at the end of the comparison. 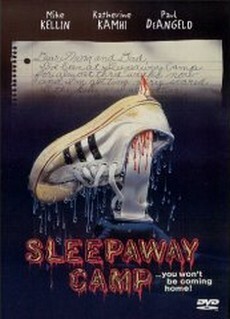 For further information about the film or the whole series, visit www.sleepawaycampfilms.com. The DVD Version begins with a dedication and a logo. The guys run across the plank and jump into the water. Further shot of Kenny's corpse, then a cut to the person in charge, then Kenny again. A snake crawls out of his mouth. Missing shot of the guys. They complain about Mel. Missing shot of Judy after Ricky showed the middle finger to her. Further shot of Ricky in the woods. Longer shot of Meg's corpse. The "plop" sound of Ricky's "mind over matter" trick, when Mozart's face hits the bum, is missing. The sentence "You guys are gross" is out of synch. At the end of the shot, which shows the girls and then the boys in the water, a "wow" scream is added. It sounds more like an howling cat. During the shot of Meg's corpse, a part of a sentence is deleted. Mel says "He did this...", but for some reason "...to get back at me" is missing in the DVD Version.